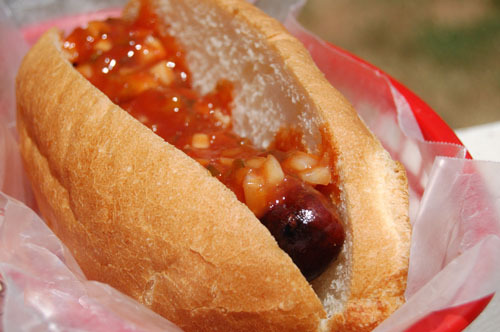 Here is an incredibly simple recipe for an outstanding relish to top grilled sausage. The ingredients are very common and consist of what you might normally put on a sausage or hot dog. However, mixing them and allowing the flavors to marry really does make it better. You can use this on any grilled sausage, but it's particularly good on Polish sausage and hot links. I grilled some of my sister's venison brats for lunch today, so that's what you see in the picture. As always, click the pic for a larger version. Note: Of course you can add more or less hot sauce to taste. Mix all ingredients well in a stain-resistant sealable container. Refrigerate two hours, or even better, overnight.